London’s £10 Toxicity Charge (T-Charge), said to be the world’s toughest emission standard, came into force on Monday morning as part of mayor Sadiq Khan's plans to tackle air pollution. Drivers of vehicles that do not meet the Euro 4 standards for both particulate matter (PM) and Nitrogen Oxide (NOx) emissions will pay both the T-Charge and the existing £11.50 Congestion Charge - a total of £21.50 – every weekday they drive in the Congestion Zone from 7am-6pm. Transport for London (TfL) said up to 34,000 polluting vehicles every month could be liable for the T-Charge but that the number of older, more polluting vehicles driving into the zone is expected to fall. Its monitoring data reveals a drop of about 15% since Mr Khan announced the charge in February. 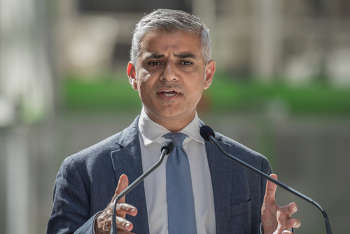 Mr Khan (pictured) said: ‘As mayor I am determined to take urgent action to help clean up London’s lethal air. The shameful scale of the public health crisis London faces, with thousands of premature deaths caused by air pollution, must be addressed. AA president Edmund King warned that there was ‘no silver bullet’ to tackling air pollution and that the new charge ‘should not be seen as an excuse for the London boroughs to introduce their own charging or parking schemes which aim to demonise diesels’. RAC roads policy spokesman Nick Lyes warned that those drivers likely to be most affected are those from lower income backgrounds as well as smaller businesses'. Leonie Cooper, chair of the London Assembly Environment Committee, said: ‘We absolutely must do more to prevent premature deaths and stunting children's lungs from air pollution – so we welcome the mayor’s T-Charge as a first step towards making London’s air less toxic. Pre-Euro 4 vehicles are typically those registered before 2006. TfL advised anyone who has a car registered before 2008 to use TfL’s free online vehicle checker.